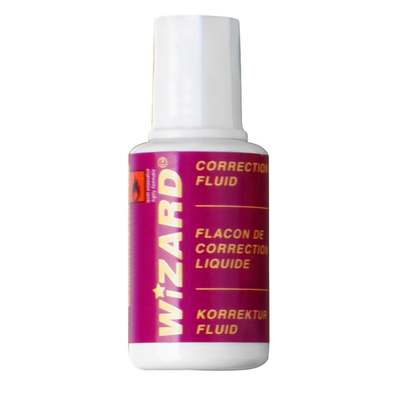 A brilliant tool for ensuring the correct communication every time, our Correction Fluid 20ml 10pk offers the properties of an eraser but on ink to all writers. Presented in a compact 20ml bottle that easily slips into draws, pencil cases or desk caddy's, this effective corrector features an applicator brush in the underside of the lid. Simply dip and slide the paint brush across your recent spelling mistake or miss-interpreted phrase and lets the opaque liquid remove all trace so you can get back to communicating the right message. Essential for anyone who favors pen writing over computer typing and key for ensuring all patient information is 100% correct, this sizeable 10 pack features enough correction fluid for an entire class of avid writers. In our Arts and Crafts section, you'll find everything you need to make sure your class stretch and exercise their creative minds - in everything from writing through to painting.